We would like to take the international campaign to a local Seattle target. Bartell Drugs still sells SodaStream, and Bartell is a locally-operated, family-run Puget Sound chain with headquarters in West Seattle. Many of us shop in Bartell stores, and many of us are even recognized by staff in our neighborhood Bartell store. With enough local pressure, Bartell would be able to decide at the local level to stop selling SodaStream. We have already flashmobbed the downtown Third Ave Bartell store, and last May during Nakba Day flashmobbing we handed them a letter telling them why they should stop selling SodaStream. Now we need to spread that message to Bartell stores all over Seattle and Puget Sound. In early November, we phoned and faxed our concerns to George and Jean Bartell, CEOs of Bartell Drugs. We asked for a meeting and have gotten no response so far. We have now prepared a letter, revised from the letter we delivered in May, which tells Bartell why they should stop selling SodaStream. You can use our letter — attached as a Word.doc and pasted below — or personalize and adapt it as you need, either by email or postal mail. During the Days of Action Against SodaStream, Nov 29 - Dec 10, will you TELL BARTELL to stop selling SodaStream? Will you email or mail or phone Bartell? Or print and hand-deliver a copy of the letter to staff at your local Bartell? We’d like to count you if you Tell Bartell. Email Linda Bevis at lindabevis1@aol.com. (Don’t forget the pesky digit “1” in the address.) If you email Bartell, bcc us. If you mail or phone or hand-deliver or have an interaction with or conversation with staff at Bartell, please email and tell us about it! Bartell is a local opportunity for us. Tell Bartell to stop selling Sodastream and all other products of Israeli apartheid. 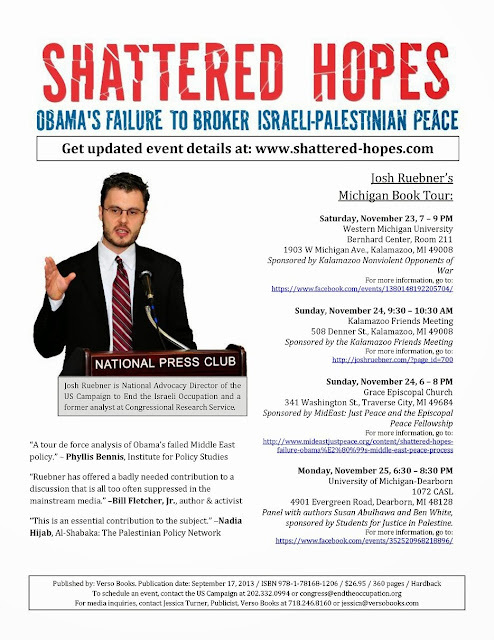 Earlier this fall, Josh Ruebner, our National Advocacy Director, shared the exciting news of the publication of his first book, Shattered Hopes: Obama's Failure to Broker Israeli-Palestinian Peace. We are proud to announce that he will be visiting Rosemont, Illinois, to hold a workshop ("Picking up the pieces of Shattered Hopes: How to engage your elected officials") and to co-host a panel ("U.S. Foreign Policy in the Middle East") with Professors Rashid Khalidi and Hatem Bazian at the American Muslims for Palestine conference. The conference will be held at the Crowne Plaza Chicago O'Hare Hotel and Conference Center (5440 North River Road, Rosemont, IL 60018) on Friday, November 29, and Saturday, November 30, the days immediately after Thanksgiving. Note that to attend the workshop, and the conference in general, one must register in advance. To do so, and for further information regarding the events to be held at the conference, click here. And for additional information on Josh's fall speaking tour, see his website here. We need your help! Sur La Table is erasing negative comments posted on their website about SodaStream. We need to show them they cannot censor the truth about Israeli Occupation! Spend 2 minutes now to help us stop Sur La Table from censoring the truth about SodaStream. Join us: write a review to help replace the censored reviews of SodaStream now! Make sure to take a screenshot and send it to seattle@jvp.org in case they delete yours! Dozens of activists and concerned consumers have been posting thoughtful comments on Sur La Table's website explaining what we think of SodaStream, a product made in an illegal settlement in the West Bank, in violation of international law and at the expense of justice for Palestinians. Rather than attend to the serious concerns about the harm caused by SodaStream, Sur La Table has responded by erasing the comments. But the good news is that we are posting new ones faster than they can delete them. Sur La Table is paying attention, and we we need to continue acting fast to show that we aren't going anywhere! Please take a minute now to write a replacement review on the Sur La Table website! Follow this link to create an account. And then go to this page and post a comment. Together, we can burst the SodaStream Bubble! What: Blitz Sur La Table’s SodaStream staff favorite page with reviews that explain SodaStream's connection to the Israeli occupation of Palestine. Why: SodaStream is an Israeli product made in an illegal settlement in the West Bank, further entrenching the Occupation. Jewish Voice for Peace Seattle has organized a campaign to demand that Sur La Table deshelve SodaStream. This campaign is in response to the Palestinian civil society call for Boycott, Divestment, and Sanctions of Israel. 3 simple steps: Make an account, post a review, take a snapshot and email it to JVP! Step 2: Click on this link to arrive at the SodaStream product page. Scroll all the way down until you find the reviews box and write a review (suggestions below)! Step 3: Take a screenshot and send it to seattle@jvp.org. The SodaStream corporation entrenches the Israeli occupation of Palestine while it directly profits from the occupation. SodaStream is a product made in violation of international law. SodaStream’s main production plant is located on confiscated Palestinian farmland. SodaStream exploits Palestinian labor to create their products. SodaStream is paid for in part by the Israeli government. SodaStream receives generous tax incentives from the Israeli and local governments to establish their factory in the West Bank on Palestinian land. Every purchase of SodaStream contributes to illegal settlements in Palestine. The factory pays taxes to the Israeli settlement, Ma’aleh Adumim, not the the Palestinian Authority. Expansion of Israeli settlements, such as Ma’aleh Adumim where the main SodaStream factory is located, erodes Palestinian territorial contiguity. Contact seattle@jvp.org if you have any questions or need help. UPDATE: We need your help! In the next two days we need 100 phone calls to Sur La Table's customer service to show we won't stand for censorship. Call: 1-800-243-0852 to register your complaint today! People in solidarity with Palestine have attempted to put over 50 reviews up on the Sur La Table SodaStream page. Sur La Table has censored all of the reviews, taking them down or not allowing them to be posted at all. You can see some of these reviews here. Call Sur La Table's customer service and tell them they cannot censor the truth about SodaStream and the Israeli occupation. My review about SodaStream was censored this weekend. Your website includes factually incorrect information, claiming SodaStream is made in Israel when in fact it is made in an illegal settlement in the West Bank. Please stop keeping this information from your customers---- you cannot censor the truth about SodaStream and the Israeli occupation. Do the ethical thing and deshelve SodaStream today! I have been informed that Sur La Table has censored reviews connecting SodaStream to the Israeli occupation of Palestine. Your website includes factually incorrect information, claiming SodaStream is made in Israel when in fact it is made in an illegal settlement in the West Bank. Please stop keeping this information from your customers -- you cannot censor the truth about SodaStream and the Israeli occupation. Do the ethical thing and deshelve SodaStream today! We are proud to announce that he will be visiting Michigan the week before Thanksgiving. We hope that you can join him at one or more of the four events he'll be doing in Michigan -- at Western Michigan University, the Kalamazoo Friends Meeting, Grace Episcopal Church in Traverse City, and the University of Michigan-Dearborn -- from Saturday, November 23 to Monday, November 25. Below is a flyer for the events, all of which are open to the public. Click here for a larger version of the image below, or click here for a PDF version. RSVP and invite your friends on Facebook to the events at Western Michigan University and at the University of Michigan-Dearborn here and here, respectively. Likewise, go here for further information on the event at Grace Episcopal Church in Traverse City. And for additional information on Josh's fall speaking tour, see his website here. We hope that you can join him at one or more of the five events he'll be doing in the Midwest next week -- in Milwaukee, Madison, Minneapolis and St. Louis -- from Monday, November 18, to Thursday, November 21. On Monday, November 18th, Josh will be at Marquette University's Lalumiere Hall, Room #114, Milwaukee, WI 53233 from 6:00 to 8:00 P.M., for a book talk and signing co-sponsored by Students for Justice in Palestine at Marquette University, Students for Justice in Palestine at UWM, the Friends of Palestine, the Milwaukee Palestine Solidarity Commission, the Milwaukee Anti-War Coalition, Iraq Veterans Against the War, and the Committee to Stop FBI Repression. RSVP and spread the word about the event on Facebook here. On Tuesday, November 19th, Josh will be at the University of Wisconsin's Mosse Humanities Building, Room 1641, at 455 North Park Street, Madison, WI 53706 from 7:00 to 9:00 P.M. for a book talk and signing, which will be sponsored by Students for Justice in Palestine. RSVP and spread the word about the event on Facebook here. On Wednesday, November 20th, join Josh for a book talk and signing at the University of Minnesota's Keller Hall, Room 3-125, at 200 Union Street SE, Minneapolis, MN 55455 from 4:30 to 6:00 P.M. This event is sponsored by the local chapter of Students for Justice in Palestine. RSVP and spread the word about the event on Facebook here. Also on Wednesday, November 20th, join Josh for another book talk and signing at Christ the Redeemer Lutheran Church, at 5440 Penn Avenue South, Minneapolis, MN 55419 from 7:00 to 9:00 P.M. This event is sponsored by Friends for a Nonviolent World, the Minnesota Break the Bonds Campaign, and Middle East Peace Now and endorsed by the Jewish Voice for Peace Minnesota, the Minnesota Coalition for Palestinian Rights, and Women Against Military Madness. For further event details, click here. And on Thursday, November 21st, join Josh for a book talk and signing at Left Bank Books, at 399 N Euclid Avenue, St. Louis, MO 63108, from 7:00 to 9:00 P.M. For further event details, click here. All of these events are free and open to the public, and books will be available at the events for purchase and signing. For further information on Josh's fall speaking tour, see his website here. Just over a month ago, Josh Ruebner, our National Advocacy Director, shared the exciting news of the publication of his first book, Shattered Hopes: Obama's Failure to Broker Israeli-Palestinian Peace. Having returned to the Northeast, he will soon be going on tour in New York City! We hope that you can join him at one or more of the three events he'll be doing in the New York area -- at the New School, the John Jay College of Criminal Justice, and Brooklyn College -- from Monday, November 11 to Wednesday, November 13. RSVP and invite your friends on Facebook to the events at the John Jay College of Criminal Justice and at Brooklyn College here and here, respectively. Likewise, go here for further information on the event at the New School's Kellen Auditorium. And for additional information on Josh's fall speaking tour, see his website here.